The increasing demand for clean energy sources has driven the academic and industrial communities to dedicate large amounts of R&D budgets for finding an alternative energy source. Increasing population and growing demands have strained ever-depleting fossil fuel sources. Moreover, the combustion of fossil fuel results in major greenhouse gasses such as carbon dioxide causing severe weather conditions such as global warming. Cultivation of solar energy using photovoltaics has emerged as an efficient alternative clean energy source. Several materials have been investigated for solar cell devices to obtain higher open-current voltage, fill factor and power conversion efficiencies. However, obtaining higher conversion efficiencies at lower cost remains a challenge. Hence, devices such as dye-sensitized solar cells (DSSCs) and bulk heterojunction (BHJ) have been studied. Graphene/ graphene derivatives (graphene-metal oxides, graphene-polymers, graphite, graphene, doped graphene, graphene-carbon nanotubes hybrids, and quantum dots) have attracted increasing attention because of their lightweight, easy and cost-effective processing, remarkable electrical, optical, and tunable band gap properties. 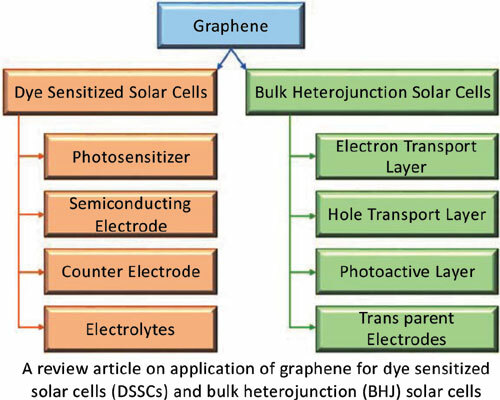 Herein, we review recent advances in graphene/graphene derivatives in DSSC and BHJ solar cells. Role of graphene and its derivatives, when used as a photosensitizer, electrode, electrolytes, electron transport layer, a photoactive layer, and transparent electrode has been discussed. The review indicates that utilization of graphene/graphene derivatives in photovoltaic applications results in improved performance and opens new avenues for future applications. Keywords: Conducting polymers, graphene, graphite, metal oxides, photovoltaics, reduced graphene oxide, solar cells. Keywords:Conducting polymers, graphene, graphite, metal oxides, photovoltaics, reduced graphene oxide, solar cells. Abstract:The increasing demand for clean energy sources has driven the academic and industrial communities to dedicate large amounts of R&D budgets for finding an alternative energy source. Increasing population and growing demands have strained ever-depleting fossil fuel sources. Moreover, the combustion of fossil fuel results in major greenhouse gasses such as carbon dioxide causing severe weather conditions such as global warming. Cultivation of solar energy using photovoltaics has emerged as an efficient alternative clean energy source. Several materials have been investigated for solar cell devices to obtain higher open-current voltage, fill factor and power conversion efficiencies. However, obtaining higher conversion efficiencies at lower cost remains a challenge. Hence, devices such as dye-sensitized solar cells (DSSCs) and bulk heterojunction (BHJ) have been studied. Graphene/ graphene derivatives (graphene-metal oxides, graphene-polymers, graphite, graphene, doped graphene, graphene-carbon nanotubes hybrids, and quantum dots) have attracted increasing attention because of their lightweight, easy and cost-effective processing, remarkable electrical, optical, and tunable band gap properties. Herein, we review recent advances in graphene/graphene derivatives in DSSC and BHJ solar cells. Role of graphene and its derivatives, when used as a photosensitizer, electrode, electrolytes, electron transport layer, a photoactive layer, and transparent electrode has been discussed. The review indicates that utilization of graphene/graphene derivatives in photovoltaic applications results in improved performance and opens new avenues for future applications.